On March 2016, we relaunched our Spanish website that (among other things) provides access to the Spanish translation of Queering the Public Sphere in Mexico and Brazil: Sexual Rights in Emerging Democracies. This book, authored by Rafael Dehesa, examines how sexuality became a fully legitimate political matter in Brazil and Mexico. 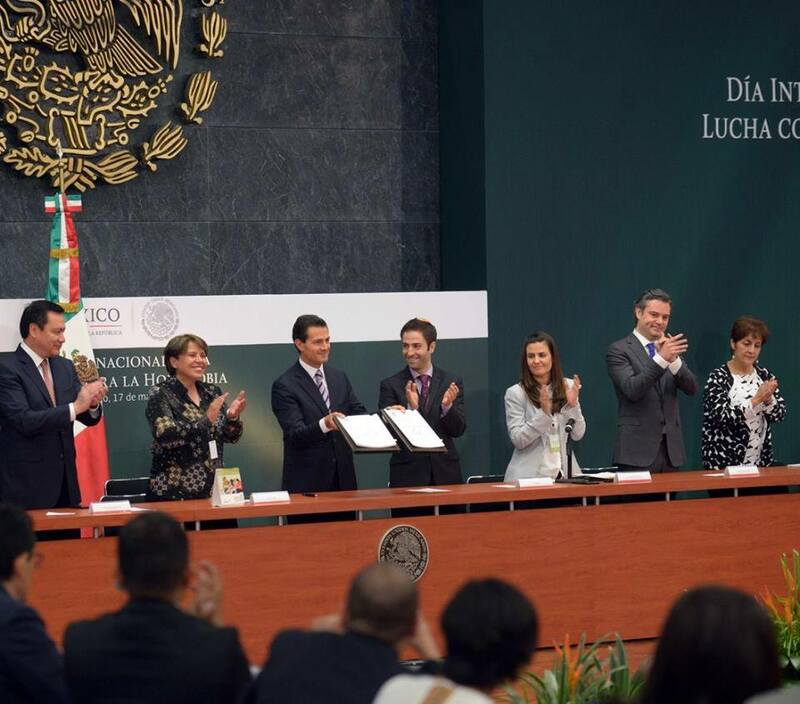 Two months later, on May 17th, the Presidency of Mexico held a high-level ceremony including President Enrique Peña Nieto in order to commemorate the International Day of Struggle Against LGBTIphobia. This event can definitely been read through the analytical lenses developed by Rafael de la Dehesa with regards to the absorption of queer politics by mainstream politics, and, in particular, by “the State”. Could you could tell us about the ceremony held to mark the International Day against LGBTIphobia, which had as its main guest the President of the Republic in Mexico? For the first time in Mexico’s history, the official residence of Los Pinos opened its doors to LGBT rights activists and defenders. This was probably the result of the work performed by the new president of the National Council to Prevent Discrimination (CONAPRED), Alexandra Haas, a young woman with much experience in the international arena. Since sHaas took office last December, she has given new direction to the Council’s work. She has called meetings with LGBT groups to set its agenda and priorities invited the Presidency to deliver a statement on May 17. This is what led to the Ceremony. Representatives of each of the many “LGBT identities”, people who advocate for the diversity of the families an a person is a members of the CONAPRED Assembly, were invited to be present. We were taken by surprise, as the President announced that new law provisions will be put on the table by the Executive Branch in relation to: the incorporation of equal marriage in the Constitution; the simplification of identity registration for trans- people across the country; the elimination of discriminatory language in laws and other legal instruments; the integration of Mexico in the Global LGBT Rights Group. During the ceremony, he instructed the Ministry of Health and Education to oversee these various legislative proposals. This was also the first time that the rainbow symbol was applied on the logos and institutional profiles of the Ministries and the Presidency itself. Furthermore, in every municipality governed by the PRI throughout Mexico, state-led activities against homophobia have taken place. The trajectory of Latin American governments in relation to LGBTI rights has been quite uneven in recent decades. It mplies many paradoxes, when we consider the ideological nuances of these administrations. We have seen left wing governments take very conservative positions in relation to sexual rights, as in the case of Ecuador and Nicaragua. Meanwhile, other leftist governments such as those in Argentina, Bolivia and Uruguay, have strongly supported these rights. There have been other situations in which a leftist government has not been very proactive, but was open to the subject, such as in Chile and El Salvador. We have also the complex case of Brazil under the Workers Party, which at first strongly promoted the visibility of the cause, but later took a route more often than not marked by paralysis or even setbacks. Then there are countries ruled by right wing oligarchies, such as Honduras and Guatemala, where the violation of LGBT rights and especially of trans people is appalling. But there are also more center right governments, such as the current Mexican administration and Colombia, which have a trajectory of supporting this agenda at the international level, but which have never made strong domestic gestures such as the one now proffered by Peña Nieto. How do you analyze this rather surprising gesture? What forces and factors can explain this strong step taken by the PRI to legitimize the LGBTI agenda in Mexico? Specially when we know that, historically, the progress made in these realms in Mexico City was mainly propelled by political parties located to the left of the political spectrum? Does this gesture have a transnational motivation? Could it be a strategy for emphasizing the PRI’s cosmopolitan spirit, in contrast to other administrations in the region? Is it perhaps a gesture to signal something to the U.S? Indeed, in international arenas the Mexican government has always supported LGBT rights but very rarely it has generated any initiatives in this domain. Today there seems to be much interest among the diplomats for Mexico to be more proactive. But until recently several factors have hampered any movement in this direction. The relationship between the Mexican state and the Vatican, for example, as surprising as this might seem. The PRI government quite clearly did not want to trouble the waters of this relationship before the Pope’s visit to the country this year. On then other hand, the political strength of the Catholic hierarchy is not as strong as it historically has been and this weakening is probably a factor that facilitated this new opening. It should be said that the PRD, the left wing party – which for so many years promoted legal reforms and protection of LGBT rights — perceived Peña Nieto’s gesture as a robbery. They consider that the current Presidency is stealing their historical agenda. But even if what was gained in Mexico City is to be positively appraised, these legal achievements and public policies have not extended to the rest of the country. Furthermore, Mexico is undergoing a very complex period regarding human rights. We know that sexuality and women’s rights have been constantly bargained away in intergovernmental politics and I dare to say that the same applies at the national level. The May 17th meeting must be placed within these scenarios. There is a national election coming up and as the Mexico City’s constitution is being reformed sexual rights are part of the discussion. At the same time, the federal government wants to recover Mexico’s role as a regional leader and to also improve its relationship with the US. It must be observed that the violent conservatism expressed by Republican presidential candidate Donald Trump is triggering an intense national debate in Mexico. Therefore, many clues must be tracked in order to fully understand what is behind the presidential initiative and what it is aimed at. We must ask if this was just a show of strength and an empty demonstration of liberal imagery, or if it really implies a serious commitment and in what direction. This event took place when large-scale and very brutal human rights violations are occurring in Mexico. In particular, there are very flagrant violations being perpetrated by the same state apparatus that is now committing itself to protect LGTBI rights. How can we situate May 17th in relation to the broader landscape of structural violence in Mexico? Indeed, the violence we are now experiencing in the country is terrible, even though there is now more silence about it than was the case a few months back. The levels of feminicide, kidnapping and the disappearance of people are alarming. The persecution and murder of journalists and human rights defenders is also skyrocketing. The “war” against the narcos that was launched by the previous administration seems to have no end. Against this backdrop, some observers have pointed out that the May 17th meeting is merely part of a strategy of “image washing”. In fact, those of us who participated have been called traitors by sectors of the human rights movement. We certainly live in a very complex situation that requires us to develop critical, but also prudent, analyses. On the one hand, the government is recognizing the need to advance on the protection of human rights and is making efforts to promote a culture of human rights, through education, professionalization and training of public servants. On the other hand, our political culture is too vertical. Quite often, those who are trained in human rights continue to be attached to old patterns of institutional behavior that are hierarchical and arbitrary. These contradictory movements are everywhere and not exclusively in the LGBTI rights field. A more provocative question: do you think PRI government’s decision to fiercely project their commitment to the LGBT agenda is motivated, in part, by pink washing? Or is it a serious commitment? There’s no doubt that the political act performed by the presidency implies many economic and political interests. We know that there is PRI interest to place sexuality and LGBT in the PRI’s on the international agenda. We also know how governments can gain os loose credibility by promoting or blocking these issues. At least in the case of the May 17th ceremony, I would say we have made a gain, but we have to follow-up in order to see how the government will implement the decisions it announced, without neglecting our engagement with the struggle of other movements. Pronouncements released immediately after the ceremony by the Office of the UN High Commissioner for Human Rights in Mexico and the Governor of Coahuila (who is the coordinator of the Human Rights Commission of the National Conference of Governors (CONAGO)) have called upon the governors of all states to ensure the implementation of the presidential guidelines. And this is quite positive. Finally, as you know, I’m concerned with the “problem of the state”: the way states play games and how the state logic of governamentality has penetrated our own frames and “ways of being”. The image of the ceremony at Los Pinos was very impressive as a sign of the State’s “ expressive politics” in relation to sexuality, along the lines of the thinking developed by Mario Pecheny and Rafael de la Dehesa in their 2009 analysis of sexuality and politics in Latin America. But the official ritual of the ceremony also projects an image of domestication. Or to put it another way, of distance in relation to radicalism, of exceeding formal politics, of queerness, if you like. How would you react to this perception? The path of the LGBT movement in Mexico has traversed through many different stages. It began with a clear leftist and feminist imprint. But this tone has shifted in the last few decades, perhaps since the first state responses to HIV/AIDS, I would say. Both the recognition of LGBT actors and organizations as legitimate state interlocutors and the influx of public funds has indeed perverted the movements’ relation with the State. Quite often today, LGBT political claims have become secondary, while establishing close relationships with State authorities and having access to large amounts of resources is what is seen as more important. This climate has triggered the emergence of new “invented” leaders and groups, which are not really grounded beyond their virtual political activity in social networks, and are also devoid of professional skills. Sometimes they are not even formally registered organizations. To put it differently, I do not think that we have a real strong LGBT movements today whose ideologies are clearly defined. I also believe that the global dominant agenda around claims for marriage equality has contributed to the abandonment of political reflections and actions with regards to other dimensions of rights and needs. On the one hand, marriage is indeed a road towards the granting of rights. On the other, the adherence to the heterosexist-familial – monogamous marriage model is a disincentive to critical thinking and activism with regards to the construction of alternative affective relationships and new forms of kinship. It also leave aside the necessary debates about sexual freedom. The insights and ideas developed by gay-lesbian studies, that view us as citizens with multiple needs and right claims in all areas of life — and that allow for establishing ways of life that differ from traditional norms and structures — is rarely part of the current LGBT political debates. It is not my intention to suggest that “all is lost”, however. To the contrary, there are organizations (fortunately spread throughout the country) that are interested in opening new spaces for discussions around individual rights which are not defined by marriage equality. As we know, we are a minority in society, but today we can say we are a much better articulated and stronger minority. Against this backdrop the presidential initiative has generated an interesting national move towards strategies that monitor the policies being proposed. This can eventually result in a new structure for national LBGT dialogues and coordination. After the interview Mexico joined 5 LAC, the group of five South American countries that tabled a resolution at the Human Rights Council calling for the establishment on an Independent Expert on SOGI and human rights.